I like Comixtribe, they always put out interesting and quirky books. I was a big fan of, "Sink," when I had the chance to acquire a digital copy for review ahead of its release and was pleased when it became a big hit thanks to its great quality. They've been promoting an upcoming comic for a bit now, "Wailing Blade." The first issue had a special release at NYCC 2018 and some copies were sold online (along with a free digital copy that was temporarily available, a nice promotion). 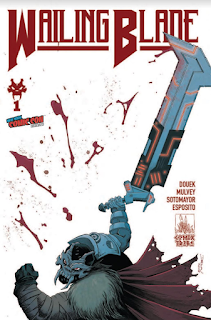 I purchased a copy of #1 as I wanted to give it a read figuring a Comixtribe book was bound to be good (plus it had Joe Mulvey on art, whose work is great). 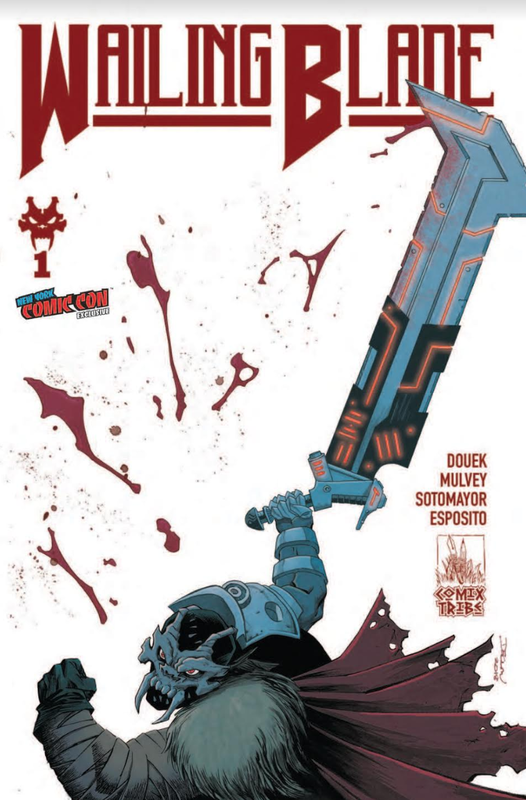 Having read the first issue of, "Wailing Blade," I can say I loved it and am eager for more! 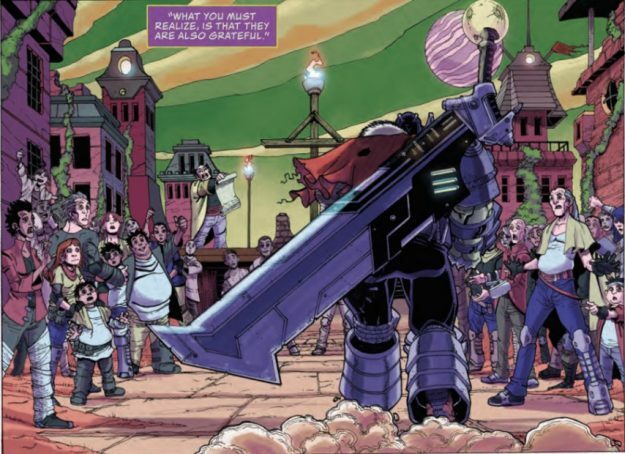 "Wailing Blade," takes place in a far-flung future well after society collapsed. This results in the world being a mixture of medieval-type structures and living conditions mixed with super-advanced technology--remnants of the long-lost past. Writer Rich Douek has a clever idea here, with the only other examples of this sort of, "Post-post apocalypse," I can think of being maybe, "Horizon Zero Dawn," and a handful of books and short-stories. Within this world there is the Headtaker, who is a soldier and executioner of sorts of the land's ruler known only as the, "Tyrant." The Headtaker is a very scary guy, and he wields the titular Wailing Blade--a massive sword that can do some serious damage. This debut issue alternates between following the exploits of the Headtaker as well as a handful of rebels who fight against the Tyrant called, "Windcleavers." The Headtaker is clearly the bad-guy here, working for a ruler whose name even declares them a fascistic dictator, but he still is an interesting character to witness the adventures of, along with the rag-tag group of Windcleavers struggling to survive in a world falling under total control of evil. As I noted earlier, Joe Mulvey is the artist and his drawing always impresses. Whether he's illustrating the surreal mixture of a lush landscape along future/ancient technology, or portraying the Wailing Blade ripping-up people in a most graphic fashion, Mulvey's art is fantastic and makes each page gorgeous. Between Douek's story and Mulvey's drawing this is a stellar debut for the new series. I am excited for when this first issue has its official release in (I believe) 2019 and will be sure to order myself a copy of it and all future issues!